So I am finally better. Although my hands are still filled with ouchy pain and my arms are very stiff. I haven’t posted on www.LuluWilliams.com in a while due to not being able to use my hands at all. Apart from clicking – which has been useful when shopping online. Wink wink. 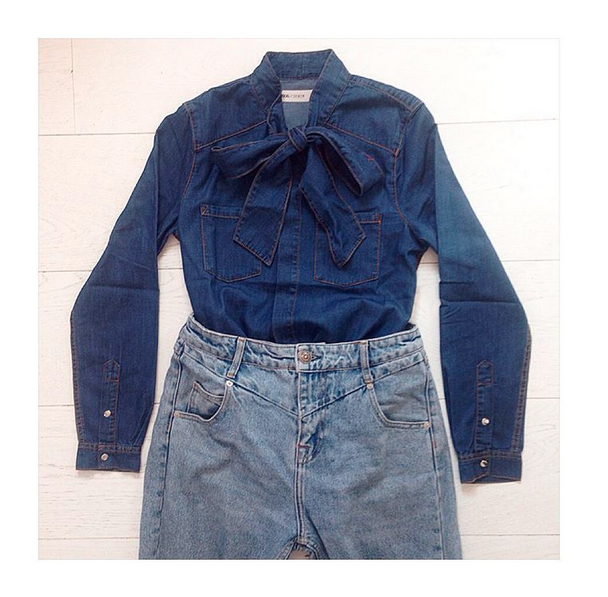 I treated myself to the ASOS denim pussybow blouse. Being a great lover of double denim it’s a fab wardrobe essential for me. This shirt is great for wearing with this season’s hottest textile – suede. It’s great with leather or PU and fab for dressing down pencil skirts. I love matching it with my high-waisted boyfriend jeans and vintage printed heels.